The action is the first since 2000 when the courts ended up imposing large fines on the IFA over its actions in blockading some factories. FARMERS ARE TWO-THIRDS of the way through a national 24-hour demonstration outside meat plants across the country. The ‘beef price protest’ started at 3pm on Sunday and is due to finish this afternoon. The Irish Farmers Association claim the price paid for meat here is a euro per kilo lower than the North. 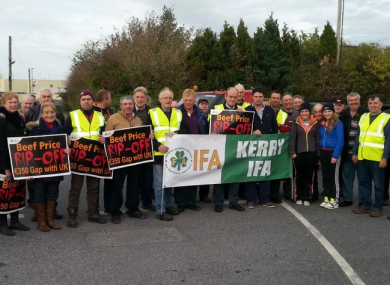 IFA president Eddie Downey said there’s strong support at the protest which “illustrates the level of anger over the massive €350 per head cattle price gap that has now opened up with our main export market in the UK. At their peak, the protests were attended by over 10,000 farmers who turned out to voice their deep frustration with the factories. The IFA President added that nobody can explain to farmers why our beef prices are €350 behind those paid to farmers in our main UK market. However, the Chairman of Meat Industry Ireland, Ciaran Fitzgerald, said that the protest will only disrupt business, damage Ireland’s reputation with customers and ultimately will not impact EU beef market prices – calling it “misguided and counter-productive”. Speaking on RTÉ’s Morning Ireland, Eddie Downey was pressed several times as to whether what is taking place today amounts to a blockade. He repeatedly insisted it is a ‘beef price protest’ and said that staff would be let in and out but he would not say whether vehicles would be allowed in and out. “It’s going to be difficult for our members at those gates,” Downey added. Additional reporting by Cliodhna Russell. Email “Farmers are holding a 24-hour protest about beef prices ”. Feedback on “Farmers are holding a 24-hour protest about beef prices ”.